There is no denying that Monaco is a true paradise for lovers of casino gaming, offering a full range of the best table games and slot machines in luxurious and friendly surroundings. 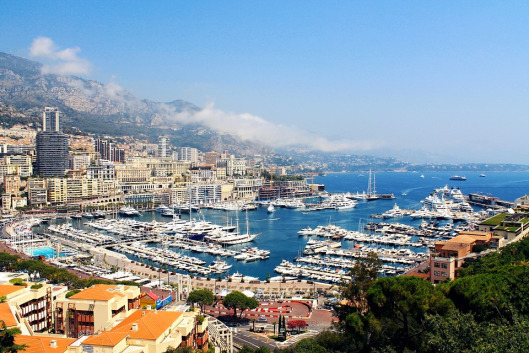 It is true; Monaco spells high-end luxury and is synonymous with some of Europe’s best casinos. The tiny city- state Monaco, the size of New York’s Central park, is a low tax haven and one of the richest countries in the world, with the most millionaires per capita! One in three are millionaires in Monaco! There is no casino more lavishly decorated and more famous than the Casino de Monte Carlo in Monaco, the second smallest country in the world (after the Vatican). Did you know that the Casino de Monte Carlo is also one of the oldest casinos in the world and one of the first gambling venues to grow into entertainment field? Let’s have a look at this world-famous casino, which has been depicted in multiple “James Bond” movies, multiple music singles, and other well-known movies and books. Designed by the famous architect Charles Garnier in 1863, it is today arguably the most iconic building in Monte Carlo overlooking the Mediterranean Sea. With its marvelous façade, striking interior, lavish Bohemian glass chandeliers, and rococo ceilings, this legendary gambling house is the most prestigious casino in Europe attracting international clients and satisfying players of all levels. Its rich history, Belle Époque design, known as Europe’s jewel, and the top quality service made Las Vegas look like a funny theme park. Casino de Monte Carlo invites every player to explore unique and special gaming experiences awaiting in its charming gaming rooms, lounge and terrace. Shining and attractive slot machines wait for their players at the Salle Renaissance and the Salle Europe, which is situated in the heart of the casino, and offers cocktail nights at bar, the gourmet meals, and a breath-taking view over the sea. Remember, the stakes are high and dress code is required, so avoid wearing your favorite shorts, sport shoes or flip-flops, as well as military or religious uniforms. This gambling and entertainment paradise in Monaco also includes the Grand Théâtre de Monte Carlo and the office of Les Ballets de Monte Carlo. Probably the most interesting fact about this gambling house is that the citizens of Monaco are forbidden to enter casino gaming rooms. Players are welcome to enjoy a number of classic casino games such as Baccarat, Craps, Poker, Blackjack, American Roulette, French Roulette, Chemin Fer, Punto Banco, etc. If you are up for some exciting American table games like American Roulette, Craps, or Black Jack, the Salle des Amériques gaming room, which was first opened in 1881, is open from 2 PM onward. The casino also offers European, English, and American roulette, Punto Banco, Chemin de Fer, Blackjack, Craps, and many other casino table games that can be found in its other ornate gaming rooms, such as the luxurious Salle Blanche with beautiful paintings of Florentine Graces, and the private rooms namely Salle Medicin, Salons Super Privés, and the Salle Touzet Nord & Sud. If it is already time for a gourmet meal, you will be pleased with Monte Carlo’s casino restaurant options, ranging from budget-friendly meals to the more refined cuisine, offering traditional Italian, Mediterranean-inspired and French dishes. There are four more casinos in Monte Carlo: the Café de Paris, the Sun, Monte Carlo Bay and Monte Carlo Sporting. The Café de Paris is a perfect choice for slot machine enthusiasts, featuring 2 outdoor terraces and over 400 themed machines. The Sun offers a wide range of table games and slot machines, as well as features live music nights and Circus Restaurant. Monte Carlo Bay casino is the smallest one, with just 140 slot machines.